Gerard drove from his home in Norfolk to meet me in London. He wanted to show me his work and have a chat. I readily agreed. I was delighted to see Gerard again after many years – and was fascinated to see his work. I waited in my house in Spitalfield – the place of the meeting. What, I wondered, would his work be like? I had only seen some reduced-scale printed reproductions – they looked intriguing but I couldn’t be sure if they possessed artistic power and presence, the force to overwhelm and capture the imagination, or were no more than competent illustrations. Gerard brought a series of large, framed and bubble-wrapped paintings into my house. As the coverings came off a revelation took place. It was instantly clear that in a miraculous and magical way Gerard had - through a process of hard work, experimentation, and critical observation – achieved something wonderful. He had, while toiling alone in Norfolk, blossomed, come of age as an artist of skill, power and originality. The process was also an agonizing one: he had ruthlessly burnt dozens of failed paintings, involving many months of work, along the way. 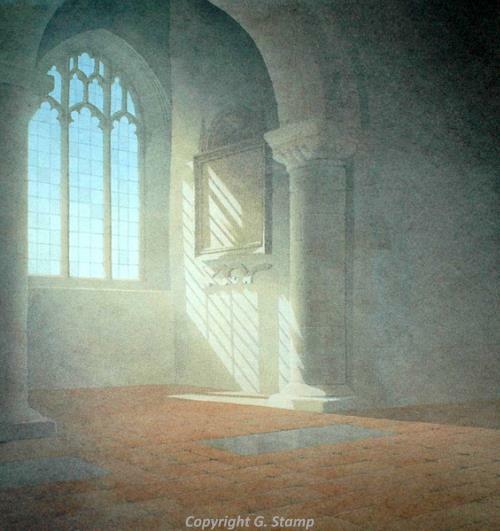 Gerard Stamp has also been inspired by Castle Acre Priory and the churches of Cawston, Hales, and Salle.